The beautiful Stortzum Family sans the patriarch, Aaron. Sadly he was at work during the shoot. It would have to be my coffee table from Fresh Digs:) I had my eye on it for weeks there at the store and talked it up with my husband, Aaron. He surprised me with it shortly after for my birthday a couple years ago. It will definitely be a "forever" piece here! Nothing now. Reading comes second after sleeping. I am an RN and work the night shift at St. Anthony's. Sleep is pretty important to me, none-the-less when I can get it. The last book I did read was a couple months ago called The Effective Charge Nurse Handbook by Swihart and Gantt. So.. so.. good . I read Fifty Shades of Grey prior to that after much pressure from Salina to do so. She said it was a "must" before going to see the movie with friends and I agreed:). Since the holidays, I have been enjoying the Pentatonix Christmas album and can't seem to stop. Also the Trolls and Moana Soundtracks are in the mix. The kids seem to get their way on car trips and I really don't mind:). Old Mac's Drive Thru in Dieterich, of course! While being co-owners of this business (with a great group of people, btw) and Aaron managing the store and cafe, we just can't get enough! The burgers are hands-down the best around! (not partial, no bias..) The chicken sandwiches, strips, and pizza are also a hit in our family. The Roadrunner (a buffalo chicken sandwich) is my fav! It never gets old.. Yum, yum:) Next time you are on Route 33, check them out, you will thank me! I love this place for the small town feel and close community. You can walk anywhere and feel safe with your kids. The church is a huge landmark here and religion is strong. You can always count on the community to pull together to help out when someone needs it. The school system and sports programs aren't too shabby either. I've lived here all my life and will not leave. I think it's safe to say Aaron (from Dieterich) has become a "wooden shoe" as well! Wild Card Question – What would you like people to know about you? I guess I would like people to know that I believe in a strong family bond and that family always comes first. My parents instilled this in me and my 5 siblings while growing up and I am determined to try to carry it on. Sunday was church and family day. Our goal in raising our kids is to try to sit down at the table at least once a day, pray before meals, and saying prayers at bedtime with them. God is our number one and the things we have wouldn't be possible without him. I am thankful for each day that comes and try to make as many great memories with family, like my parents did. We love our kids and always tell them to "Do your best and let God do the rest". Mostly, I believe that time is precious, live for the day! Mirror de la Fresh Digs. We're going to get to homeowners, Aaron and Monica Stortzum and their three kids Myles (10), Lily (8) and Tess (5), in a bit but first I want to talk about their town. This is our second issue featuring a home in Teutopolis, IL, so I feel like I need to tell you a little more about this “City of Tuetons” (that’s “Germans”, folks) or “Home of the Wooden Shoes”. T-Town, as us locals call it, is located four miles east of Effingham and covers an area of just over 1.5 square miles. It is a very tight-knit and vibrant community with the cornerstone being St. Francis Catholic Church (click through, it has a stunning sanctuary), which houses a Monastery Museum and a recycling drop-off location on its premises. This village is largely served by family-owned businesses with the landmark being the 150 year old clothing/jewelry store where families have been buying suits and wedding rings for generations. Another shop sells everything from groceries to guns to gas; across the street is a drive-through liquor store and down the street is the high school where they close school for the first day of deer season. The village has two newspapers (yes, two), one restaurant and a number of bars. Residents are allowed to drive around in golf carts. It’s a place where when Monica tells people her last name they say, “That’s not a T-Town name”. But nicely. You get the picture. Close-knit small town, everyone knows everyone. But in a good way. Usually. This gleaming kitchen is thanks to spotless white painted kitchen cupboards. And they are thanks to a team of family members pitching in to get them painted in the week before the Stortzums moved in. Just like this town, the Stortzums have God at the center of their lives. Monica’s dad, Larry Habing, painted the red and white stool for her; in fact, each of her siblings has such a painted chair from their parents. Hers is laying in wait in the corner for when one of the kids needs a boost or Monica needs to change a lightbulb. Monica fell in love with blue glass and has been collecting it since college. The etched champagne flutes from her and Aaron’s wedding as well as auction finds of her mother, Rita, reside in this cupboard. The glass allows her to display these lovely mementos of her life. How about that fantastic clock? Monica's dad won it at an auction in T-Town and gave it to them to go with their 1960s home. Monica got the shades from JC Penney. Around the corner from the kitchen is the laundry area. Aaron single-handedly and only with a few fits of rage re-worked this closet by removing the doors and installing the closet system. The wire and jute shoe basket came from Fresh Digs. Down the hall from the laundry room is this bathroom that Aaron’s step-dad and mom redid in five days while they were away on vacation in Mexico. And they did it while watching their three kids. Wow. Monica's mom is a great shopper. She scored a number of these windows at the St. Francis auction held during the town's terquasquicentennial (see what I mean about close community?) celebration. These windows were once in the Monastery Museum. It looks beautiful on the wall with the magnolia wreath. Let me also add that Teutopolis is notorious for having a very highly regarded and desirable school system - think private school at public school prices. There’s virtually no crime and 95.2% of the population (as of the 2000 Census) live above the poverty level. It has a population of 1,530. And as you see, family likes to hand down homes to family. See what I mean in this issue of What's Inside? So a few years ago when Aaron and Monica Stortzum were given an opportunity to move into a home in Monica’s hometown, just down the road from her parents, the young family jumped at the chance. The previous owners, Eric and Karen Roley - distant cousins of Monica's – called them up one day saying they were moving and they wanted to keep this home "in the family”. Monica and Aaron couldn't have been more grateful to them. Monica says it was perfect timing as the year lease on their apartment in Effingham was almost up. She always wanted to get back into T-Town and this was her chance. It has been since moving into this home that the Stortzum family has taken the plunge into business ownership. Like a brick and mortar business with multiple investors and a completely new idea. They, along with a group of friends/family, opened a drive-through convenience store and café - Old Mac’s Drive Through - in the nearby town of Dieterich, IL. Their website does a great job at explaining the concept but the main thing you need to know about it is that they sell a 10 lb cinnamon roll. I’ve seen it, I’ve eaten it, I love it. Thirty dollars and a phone call will get you your very own. Have their under $7 lunch special while you’re picking it up and for kicks be sure to drive thru the “aisle” and see what that’s all about. Trust me, it’s all worth the 15 minute drive from Effingham. Anyway, back to the Stortzum home. Although this home was initially owned by Monica’s Great Uncle Herman Hoene, the Stortzums have made great use of its three bedrooms and full basement. This is totally a kid-friendly place and being one of Salina’s good friends it’s full of Fresh Digs items along with things they’ve gotten from family and purchased brand new. In honor of Fresh Digs launching a kids line we’re focusing on kid spaces this month. We hope you feel inspired and find ideas and inspiration for your own kid spaces. Kids live here. This is the kids' upstairs play area just off the kitchen and it is complete with all the things needed for a tea party. A little table and chairs is exactly what every playroom needs. The little theater in the basement. The entire basement is an undeveloped space perfect for kids to hang out. They got the riser from a good friend for Lily’s birthday so she and her cousins could perform Justin Bieber songs. Ever since then the kids have been putting on plays on this “stage”; mostly Star Wars ones. Monica hopes to one day turn this large downstairs space into a finished basement. We hope to come back and see it one day. I love peeking into people’s closets. This stairwell leading up to the attic is the perfect spot for games, games and more games. Here we have Lily and Tess’s room. They share this room and the theme is the Princess and the Pea. I love the addition of the gold dot wall decals on the purple wall. Such an easy way to jazz up a room. We do have similar ones in Fresh Digs. Salina, co-owner of Fresh Digs and friend of Monica's, made the headboard and Monica got this adorable comforter set at Land of Nod. The pea kills me. Peek down the hall at the built-in storage - so very fabulous with its gold pulls and so very 1960s. Tess’s favorite thing is her brightly colored makeup kit and Lily’s is, well, her makeup kit, albeit a little less bright. Girl things. The bedside table came from Fresh Digs. Monica painted the dresser gold and stenciled the top. 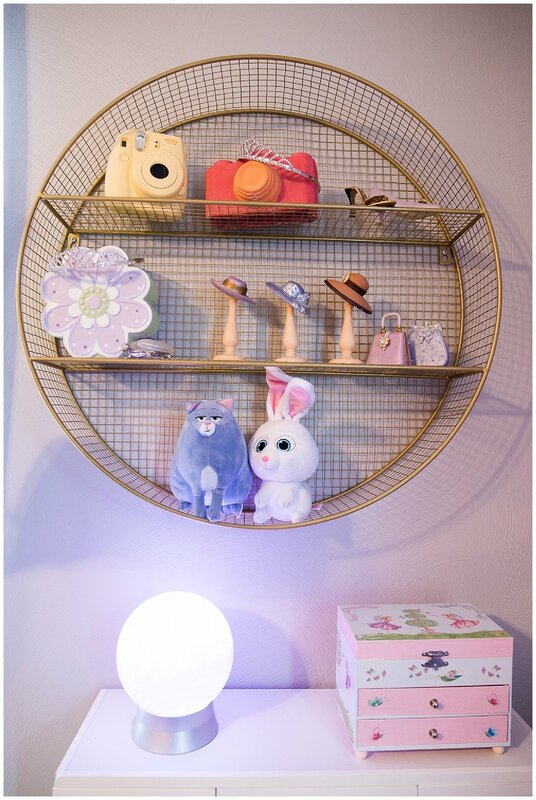 The vintage yellow lamp came from the backroom at Fresh Digs. The pink ceramic camera came from Fresh Digs and Aaron's mom, Grandma Judy, gave the girls the hats and purses. Monica found the Princess and the Pea wall hanging on Amazon and the paper lantern came from Fresh Digs. And on to Myles's room. In here it's all boy. Although, as you will see, Myles loves Star Wars he's developed a new hobby - model ship building. Monica’s done a great job of maximizing Myles’s space. The bunk-beds are great for when friends sleepover and a number of vertical shelves keeps his things neat and orderly. His favorite thing is this Lego wall (top). What's with the Barney Fife picture, you ask? Well, that's something Aaron has had since college and this is where it has landed. Gotta have books. The decoupaged mason jar was a gift to Myles from Lily that she got from the school's Christmas store. Here's the desk where the ship making magic happens. This chalkboard from Fresh Digs that hangs on Tess and Lily's door shares a great message for us all. Once again we've taken a peek inside a home of a family that is like so many of us around here - surrounded by family while working to create a better community for ourselves. As their business grows I can't wait to see how this house changes. Thank you Stortzum family for letting us inside! Tytia Habing is an award-winning and highly regarded fine art, family and commercial photographer based in the Effingham, Illinois area. You can see her work at tytiahabingphotography.com. Joanna Davies is co-owner of Fresh Digs in Effingham, IL. Fresh Digs sources locally, globally and uniquely made home goods and gifts and displays them in a shopping experience some have said is good for the soul. We also like to get people together. Join us.